Almost seven years back when the first trashcan was emptied near Bashir Ahmad’s house in Sidique Colony in Sopore town, he protested. But Ahmad’s lone protests fetched him no attention and the dumping turned into a regular affair ever since. “First it was the residents themselves who dumped their trash near the colony,” recalls Ahmad. Soon residents from nearby localities started bringing their trash bins to the area. Even municipality officials bring trash from different areas and dump it at the site. “This turned the entire locality in a stinking bowl,” said Ahmad. The problem aggravated when municipality failed to empty the container regularly leaving entire locality vulnerable to diseases and stench. “They would come and dump garbage into the container without taking out the previous one,” said Ahmad. The entire place is home to hundreds of stray dogs who scavenge through the trash. Interestingly the local municipality office is barely a few hundred meters down the road. “Our repeated requests to remove the container fell on deaf ears,” said Ahmad. Ashraf said that he and his colleagues have raised this issue with the local authorities quite often, but there was no positive response so far. According to the municipality officials, Sopore town generates approximately nine metric tons of trash every day. However the lack of proper garbage disposal management mechanism forces residents to dump most of its trash in areas like Iqbal Market, Model Town, Batpora, Down Town, Chankhan etc. But officials have a different take on the menace. The designated dumping site at Tulibal for Sopore town was abandoned after locals protested against it in 2009. “We were confronted by the residents of Tulibal. They chased our workers with daggers and canes forcing us to stop using that place,” said Ghulam Mohammad Lone, Executive Officer, Municipal Council, Sopore. Other reason for abandoning the said dumping site was that Tulibal falls under Sangrama constituency. “The issue took an ugly turn when a local politician joined in and pitched for the removal of the site,” said Mukhtar Ahmad, a local shopkeeper. This prompted authorities to identify an alternate site for setting up a garbage disposal plant. But the work was stopped even before its completion. “Despite identification of (alternate) dumping site at Adipora and Tarzoo Sopore, no decision has been taken by the higher authorities for the allotment of land,” said Lone. Interestingly, Sopore municipality has already spent Rs 12 lakh for construction of an approach road to proposed Adipora dumping site. “We are facing objections from general public here, as well,” said Lone. The identification of other such sites in and around Sopore town has faced same sort of resistance from the residents around them. “Nobody wants a dumping site in his backyard as it stinks and also breeds a number of diseases,” said Ahmad. However officials maintain that establishment of such sites are scientifically accredited Solid Waste Management projects. They are quite environment-friendly projects with employment generation avenues for people living in the vicinity. 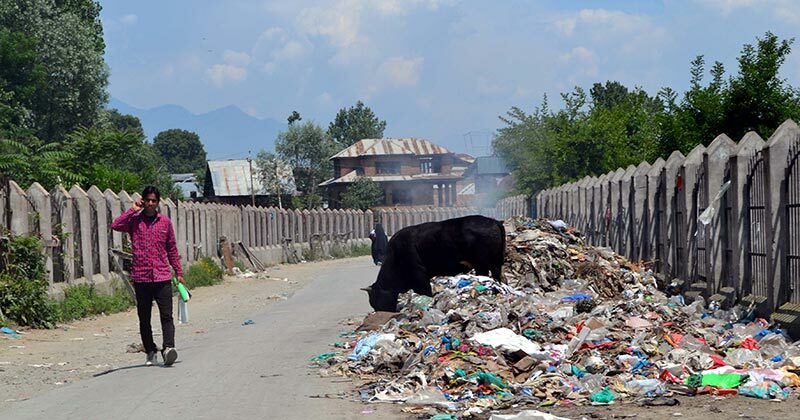 Recently, deputy commissioner Baramulla in consultation with the authorities of pollution control board has identified around 45 kanals of land at Tarzoo, Sopore, for garbage disposal. Also another site in same area is being considered for the disposal and treatment of waste in Sopore. “Till then we have to live in a mess,” said Ahmad.